USA, 1950s Raymond Loewy designed this clean-lined dresser for the Mengel Furniture Company. Solidly constructed of a handsomely grained oak, it features seven drawers with the original long aluminum drawer pulls. A corresponding low dresser is also available. 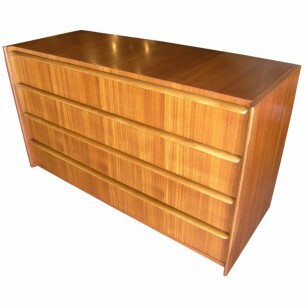 USA, 1950s Raymond Loewy designed this clean-lined dresser for the Mengel Furniture Company. Solidly constructed of a handsomely grained oak, it features four drawers with the original long aluminum drawer pulls. A corresponding high dresser is also available. USA, 1950s This dresser was designed by Paul McCobb and manufactured by Calvin furniture. It is constructed of mahogany with a brass frame and brass accents. The dresser has six large drawers and four small drawers. Original label is intact. USA, 1950s Merton Gershun designed this handsome walnut sideboard for Martinsville’s Dania Collection. On the left, three deep louvered-front drawers create a seamless flow. On the right, two doors with brass pulls conceal three white lacquered drawers and additional shelving. USA, 1940s Created by William A. Berkey Furniture Co. for its parent company Widdicomb, this charming small walnut dresser features three drawers with ornately carved, gold-leafed fronts. USA, 1950s This petite dresser features 4 roomy drawers concealed behind two accordion doors. USA, 1950s Designed by Paul McCobb for Winchendon Furniture’s popular Planner Group line, this dresser is constructed of solid maple and features six spacious drawers. France, 1930s This demi-lune French dresser is composed of a beautiful burl wood case with four contrasting reeded columns. It features three deep drawers with brass ring drawer pulls. USA, 1950s Designed by George Nelson for Herman Miller, these walnut dressers feature satin chrome J-shaped drawer pulls and rare satin chrome tapered legs. The upper drawer of each is divided into six compartments. A corresponding larger dresser also available. 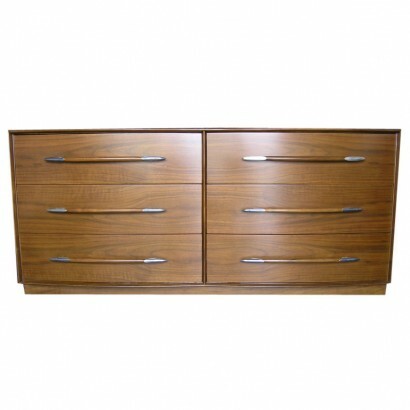 USA, 1950s Designed by Paul McCobb and manufactured by Calvin Furniture, this four-drawer dresser features aluminum accents and slender drawer pulls that emphasize its clean lines and beautiful walnut grain. USA, 1950s This walnut dresser by T.H. Robsjohn-Gibbings for Widdicomb features a beveled frame that houses three deep drawers. Original cloth Widdicomb label. Two available. USA, 1950s This dresser by George Nakashima is made of solid walnut and features beautiful dovetail joinery and six flush drawers. USA, 1950s This chest cabinet by George Nelson, model 4620 from Herman Miller’s Basic Cabinet Series, features five drawers with dividers in the first and third drawers. USA, 1950s This chest cabinet by George Nelson, from Herman Miller’s Basic Storage Components, features five drawers and one cabinet with two adjustable shelves. A corresponding five-drawer chest is also available. USA, c. 1947 This dresser was designed by Edward Wormley for Drexel’s Precedent Collection. It is composed of silver elm and features ten drawers with brass-plated zinc pulls. USA, 1950′s This cabinet by John Widdicomb is stained in a rich red tone. Two sliding doors enclose eight drawers. A coordinating pair of dressers by John Widdicomb is also available. USA, 1950′s This cabinet by Harvey Probber features two rattan doors that slide open to reveal its inner storage. Three white drawers occupy one half of the cabinet, and open storage with one adjustable shelf occupies the other half. USA, 1950s This dresser by Harvey Probber features four drawers: two large drawers and two small drawers, one of which is divided into three compartments. Brass drawer pulls and brass-capped feet compliment the warm tone of the mahogany. USA, c. 1947 Edward Wormley designed this small four-drawer dresser for Drexel’s Precedent Collection. Composed of silver elm, it features large brass-plated zinc pulls. USA, c. 1947 This dresser was designed by Edward Wormley for Drexel’s Precedent Collection. It is composed of silver elm and features five drawers with brass-plated zinc pulls. USA, 1950′s This dresser was designed by George Nelson as part of Herman Miller’s basic cabinet series. It features four drawers with curved chrome-plated drawer pulls, and it sits atop rectangular ebonized wood legs. USA, 1950s Walnut dresser by Paul McCobb with two shallow drawers and four deep drawers. Features aluminum drawer pulls and trim. USA, 1980′s This dresser by Dakota Jackson features six drawers with shell-shaped metal drawer pulls. It is finished with a striking yet subtle checkerboard veneer effect. USA, 1970s Beautiful dresser from the Mosaic Series by Lane. Dresser features nine drawers and a rare attached mirror. Tall dresser also available. USA, 1960′s This unique dresser is accented with leather-front drawers and diagonal grooves. USA, 1940′s The unique spacing of the pulls on this elegant dresser create a distinct look. Two shallow drawers above three deep drawers provide ample storage space. USA, 1950′s Handsome double dresser with six large drawers. USA, 1950′s This elegant and multi-functional piece features a three-drawer dresser below a spacious secretary desk with one large drawer and eight small storage drawers. USA, 1950′s This spacious chest of drawers features a divided top drawer and original black leather pulls. USA, 1950′s This beautiful double dresser is sitting on 4 casters for easy moving. USA, 1950′s This pair of #M524 “Mr. 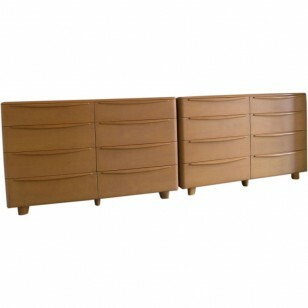 and Mrs.” dressers from the Encore Bedroom Group by Heywood Wakefield were manufactured between 1948-1955. These dressers are in pristine condition. United States, 1940s Designed by Gilbert Rohde for Herman Miller in the 1940s, this chest of drawers is clean-lined, with integrated pulls that run its width. The dresser has been beautifully refinished, bringing out the distinctive grain of the walnut.